You stand before Velkan the White, the world’s most powerful archmage. Velkan chants arcane words whisper soft and suddenly your bodies envelop in harmless blue flames. “Are we immortal?” you ask. “Not entirely, no. Stay alive at all costs when appear the strongest servants of the Evil Keeper... those rare few bearing the Mark of Darkness. For to fall before these most powerful of fiends is to perish forevermore. Øone’s Venture©, Venture© for short, is a fast, simple game of dungeon adventuring, where brave heroes undergo a quest to foil the schemes of the Evil Keeper. The heroes adventure in a deadly dungeon, where lurks a formidable Servant of the Darkness, otherwise known as a Boss. Heroes must locate and do away with this villain, but each time a hero falls in battle, rests at a shrine, or acquires treasure, they only empower the Servant of the Darkness who waits for them at dungeon’s end. 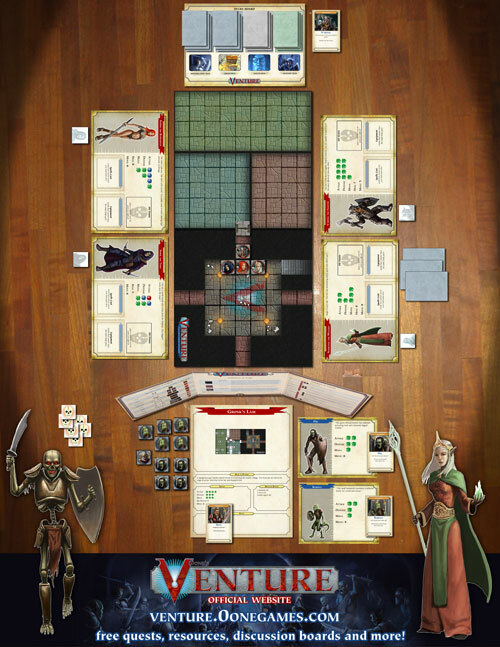 Venture© is suited for 2-5 players. Sessions last an average of 60-120 min. depending upon the quest. • Rulebook and Quest sheets: A richly illustrated full color rulebook with plenty of examples and images to help you understand the game. You get also ten quests to play right out of the box. • Heroes Sheets and Monsters Sheets: Four heroes sheets and five monsters sheets containing vital information about the characters of the game. • Game Tiles and Decks Board: Six big (9x9") tiles you can assemble in different configurations to build deadly dungeons. The Decks Board is very useful to keep track of the four decks you need to play the game. • Evil Keeper Screen: A gorgeous three-panels screen the Evil Keeper must use to hide away vital information from heroes The screen also displays useful information on its backside. • Regular Counters and Travelmate Counters: The game has counters to indicate hit points, traps, and essences. Furthermore the Travelmate counters allows you to play the game without any paper model or miniature. • Cards: You get a set of 94 illustrated cards, they allow to keep track of the initiative, cast spells, use equipment and play events. • Paper Models: The game includes a set of beautiful and easy-to-build paper models which will give it the third dimension and will make your game to look awesome. The paper models include doors open, doors closed, shrine, tables, bookshelves, tombs and chests. • Paper Miniatures: A set of twelve different paper miniatures will add depth to the game including 1 fighter, 1 wizard, 1 barbarian, 1 thief , 14 kobolds, 14 Orcs, 14 Skeletons, 14 Zombie, 14 Ogre, 1 Evil Mage, 1 Death Knight, 1 Chaos Fighter. • Bonus Materials: A buildable full color box to store your game and dice stickers. Be aware that the box must be printed in a print server because it exceeds the size of a normal US letter sheet. Note: You will need six sided Dice of various color to play this game, an average of 10 green dice, 5 blue dice and 4 red dice. 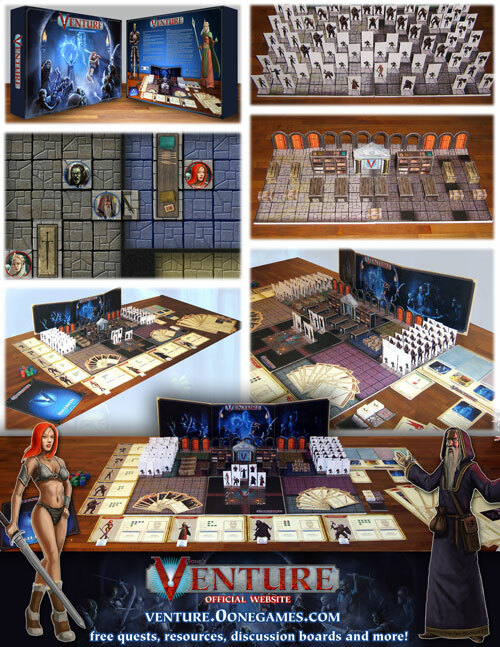 - If you buy this edition of the game you will not need Venture, The Travelmate Edition nor Paper Models & Miniatures. - This game comes as a group of PDF files, you must print them and build the game before play.